Before DEF CON 22 started we published an article that the EFF (Electronic Frontier Foundation) was going to host a very interesting competition called SOHOplessly broken. This competition was to features a large array of common SOHO (small office home office) routers and put them to the security test. As you might imagine the competition revealed that security is not the primary focus of this segment of the market. In all a total of 15 zero day vulnerabilities were uncovered during the competition in four common routers. In Mid-2011 it was revealed that many Supervisory Control and Data Acquisition (SCADA) devices were visible on the internet with a simple Google search. What was even more terrifying was that many of these devices still had the default username and password set and were visible in the search results. In 2009 someone with the same idea developed a search engine that was able to find connected devices as a service making it easier to find them and… exploit them. In January of 2012 a security flaw was found in the way that many (if not all) connected IP cameras operated. 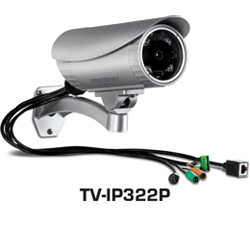 The flaw was originally found in a TRENDNet’s IP camera (a discontinued one) and it was a serious one. CES 2012 Las Vegas, Nevada – CES for us was not all booth babes and motherboards. We also wanted to stop by one of our long time partners TRENDNet and take a look at some of the new networking products they are going to have available to you in 2012. TRENDnet (www.trendnet.com) :: Leading Manufacturer ofNetworking Products. TRENDnet, under the registered trademark TRENDnet,provides networking solutions for: Enterprise Network, Home Network,Small Office, SOHO, 10Mbps Ethernet, 100Mbps Fast Ethernet, 1000MbpsGigabit Ethernet, 11Mbps Wireless LAN, 22Mbps Wireless LAN, KVM, SNMP,Fiber, Cat5 and Cat 5e cables and accessories, PCMCIA Adapters forPocketPC and Notebooks. TORRANCE, Calif. -September 6, 2011-TRENDnet, a best-in-class wired and wireless networking hardware brand, today announces the availability of the SecurView Outdoor PoE Megapixel Day/Night Internet Camera, model TV-IP322P, which provides powerful Megapixel night vision in complete darkness for distances of up to 20 meters (66 feet). TRENDnetis an award winning global brand, dedicated to providing a completeline of high quality yet affordable networking solutions for small tomid-sized business and home users alike. Founded in 1990, TRENDnetis headquartered in Torrance, California, and maintains branch officesin Europe, Central America, South America and Asia. TRENDnet productsare sold in over 125 countries. The TRENDnet brand is consistentlyrecognized for high quality, exceptional performance and unparalleledsupport. For more information visit www.trendnet.com or call +1 (310) 961-5500. TORRANCE, Calif. -September 5, 2011- TRENDnet, a best-in-class wired and wireless networking hardware brand, demonstrates today from IFA Berlin the 200Mbps Compact Powerline AV Adapter, model TPL-306E, which connects computers and network enabled devices such as Internet televisions, NVRs, and game consoles to the Internet using existing electrical lines. Its small form factor saves space when plugged into a crowded electrical outlet. Network one adapter to a router and plug another adapter into any outlet on the same electrical system for instant high speed network access. TRENDnet adapters connect automatically to each other over a secure encrypted signal with no CD installation required. For additional security, press the Sync button to change existing encryption keys. LED displays convey device status for easy power management and troubleshooting. Embedded power saving technology lowers power consumption by up to 70% in standby mode-resulting in measurable power savings, given that the device is always on. 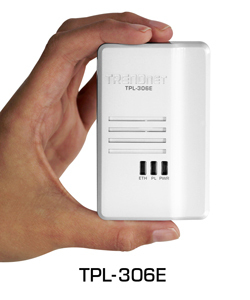 The 200Mbps Compact Powerline AV Adapter, model TPL-306E, comes with a three year limited warranty and will be available from TRENDnet's online and retail partners this coming December. The 200Mbps Compact Powerline AV Adapter Kit, model TPL-306E2K, comes with two TPL-306E adapters, a three year limited warranty, and will be available from TRENDnet's online and retail partners this coming December. TORRANCE, Calif. -September 2, 2011- TRENDnet, a best-in-class wired and wireless networking hardware brand, demonstrates today from IFA Berlin the first 4-Port 500Mbps Powerline AV Adapter, model TPL-405E, which features four Gigabit ports to connect all media center devices to a high speed 500Mbps Powerline network. New media center devices such as Internet televisions, NVRs, Receivers, and game consoles are now network ready-meaning that each device is capable of streaming large HD files directly from the Internet. TRENDnet's ground breaking 4-Port 500Mbps Powerline AV Adapter connects up to four media center devices to the Internet at the same time using existing electrical lines. "Network ready Internet televisions now make up to 50% of total television sales in select markets," stated Sonny Su, Director of Technology for TRENDnet. "The need to connect multiple media center devices to the Internet is already here and we are excited to be able to bring compelling Powerline solutions to market." 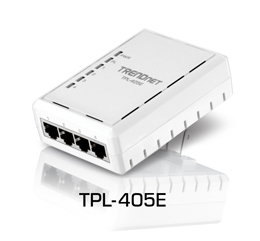 The 4-Port 500Mbps Powerline AV Adapter, model TPL-405E, comes with a three year limited warranty and will be available from TRENDnet's online and retail partners this coming December. One of the nice things about the latest generation of the 802.11 wireless specification (802.11n) is that there is a lot of headroom available in it before there is a need to move to a new generation. When 802.11n first hit the market it was limited to around 150Mbps. This was due to quite a few factors, most notable of these was the use of spatial streams (breaking the signal into separate streams and reassembling them in proper order at the far end. Once this was combined with MIMO (Multiple In Multiple Out) things really took off. Now we are hitting the upper edge of the 802.11n spectrum with the 450Mbps routers and adapters. This new line is getting up there and finally pushing the upper limits of what you can do with this latest revision of the 802.11 protocol. We have another one of TRENDNet’s 450Mbps wireless routers in the lab. This time it is the TEW-692GR a 450Mbps concurrent dual band gaming router with a price tag of around $135. So follow along as we find out if this is really worth your time and money. The launch of the 450Mbps segment of the 802.11n specification was sort of backwards. We saw some of the first routers last year in the September – October time frame. Then at CES we got our first glimpse of one of the new 450Mbps wireless adapters. This was the TRENDNet TEW-687GA that we just finished testing. But we are not going to stop there as we have another 450Mbps adapter from TRENDNet in the lab. This one is more PC specific and connects over USB 2.0. You lose the universal appeal that the 687GA had but gain more on portability. So let’s introduce the TRENDNet TEW-684UB 450Mbps Dual Band USB wireless adapter.